On a Thursday morning in early October Ellery Queen was grappling with more fundamental concerns. The cross-country flight west to Los Angeles had been bumpy, particularly over the Rockies, and he had been bone-weary when the cab deposited him . . . . [H]is sleep had been fitful, and by morning he had still found himself more than a little disoriented in time, thick of tongue, and feeling every bit of his seventy years. Mr. Queen lamented the loss of the leisurely cross-country Pullman trips of yore and grumbled, not for the first time, how flying so unforgivably takes the travel out of travel. What is it about a train that lends itself to narrative fiction and, particularly, to mysteries? The question is open to some debate, but to my mind there are several aspects to train travel that can be irresistible to those of us who tell stories. First, a passenger on a train is both a part of the world, and yet apart from it, traveling in a defined slice of life that is removed from everything else. Second, time passes relatively slowly on a train -- there are opportunities to move about, to have contact with others over drinks or in a dining car, where seating is luck of the draw and we never know who may be across from us at the table. Jimmy Buffett said something about sailing that is equally true of riding the rails -- “fast enough to get there, slow enough to see: moderation seems to be the key.” Unlike airplane travel, where the terrain passes by miles below us, on a train we witness every mile, yet we are apart from each of those miles, encapsulated in a microcosm world. There is an undeniable romance to this. Third, the train contains its characters, almost like a locked room. The cast is all there, rolling on the rails and quarantined from the every-day world, which can only be observed as it glides by. -- the same Orient Express that captivated Christie -- from his own wartime journeys on the fabled train. The same lure of the rails lies at the heart of Hitchcock’s 1938 classic The Lady Vanishes, which was, in turn, based on the 1936 novel The Wheel Spins by Ethel Lina White. And Hitchock returned to the rails with North by Northwest. More recently Sara Gruen’s best seller Water for Elephants relies as much on the train as it does on the circus for its setting, and the 2008 movie Transsiberian is not only a mystery and thriller, but a grand homage to the Trans Siberian Express. So there are lots of stories that take place on a train. But what about fiction that is written on a train? After New York City-based writer Jessica Gross took the first "test-run" residency, traveling from NYC to Chicago and back, Amtrak confirmed that it is indeed planning to turn the writers' residencies into an established, long-term program, sending writers on trains throughout its network of routes. All told, it sounds like a truly exquisite experience. Gross later detailed her trip in The Paris Review: "I’m only here for the journey. Soon after I get to Chicago, I’ll board a train and come right back to New York: thirty-nine hours in transit—forty-four, with delays. And I’m here to write." What, exactly, is the appeal of writing on a train? In a phone interview with The Wire, Gross described the train ride as a "unique environment for creative thought," one that "takes you out of normal life." She won't find much disagreement. Now more writers (The Wire's staff included) are clamoring for their own Amtrak residency. “I’ve seen a billion tweets from other writers saying ‘I want one of these’,” Gross said, probably being a tad hyperbolic, but it's true that once Amtrak actually does start offering writers' residencies regularly, they're going to be very popular. Julia Quinn, social media director for Amtrak, tells The Wire that there has been "overwhelming demand" from people interested in the program – part of the reason the company is intent on turning this into a regular operation. Unfortunately not all of the press generated by the program has been as glowing as the story from The Wire. The Washington Post on March 13 served up a grousing review of the project that basically argues that Amtrak is publicly funded, already expensive, and shouldn't be giving away anything for free -- even to writers. The author of the piece, Post writer Dan Zak, attacks the modest Amtrak Writers’ Residency not by criticizing the program itself, but by attacking Amtrak for offering it. Amtrak’s 400-plus-mile routes [Zak snivels] posted an operating deficit of $614 million in 2012, while its shorter routes (like those between the District and New York) had only a $47 million surplus, according to a 2013 Brookings Institution report. And yet ridership more than doubled between 1997 and 2012. Amtrak, birthed by a government bailout of the country’s privately operated rail network, is a publicly funded for profit entity. Amtrak's ridership has set new records in something like 8 of the last 10 years. Many Amtrak runs, including long distance runs, operate near or at 100% capacity; that is, the only reason more riders (and more revenue) is not secured is because of the limited number of cars available to Amtrak (a fact that does derive from Mr. Zak's mathematical penchant). It seems to me the answer to a viable national rail network is the same as the whispered promise in the baseball epic Field of Dreams: If you build it, they will come. For a host of obvious reasons Amtrak’s Writers’ Residency program is likely not for math majors of Mr. Zak’s ilk, who focus on cost to the exclusion of value; expense to the exclusion of investment. But in any event (and again) Amtrak's Writer Residency program is not about math. Rather, the program is for the romantic. If you are more poet than mathematician, well, take a look. Applications can easily be submitted to Amtrak on-line. Residencies will be anywhere from 2-5 days, with exceptions for special projects. Dale, I read this early this morning and thought, "That's something I would have done in my younger years. Well, I've changed my mind. It's something I'd like to do now. Don't know if I'll be accepted, but I'll be entering as soon as I decide what writing to upload on the application. I've always loved trains and Gene Holdway and I have written several train songs. I once spent from Washington, DC, to Columbia in the bar car of a train, but that was long ago. If accepted, I'd spend the time courting my muse (My muse is male)and finding inspiration. In his later years, Bernard Shaw travelled incessantly, back and forth, on ocean liners, back when they still had ocean liners, and i can see the appeal. I have always loved trains -- used to take one back and forth to college even though it was slightly less convenient and slightly more expensive than buses, just because i like them so much. I was on a train in England a few years ago and happened to be seated next to a businesswoman who groused (mildly, in the English fashion) about the shortcomings of their rail system, and i just laughed and told her she had no idea how bad American trains are by comparison. I agree with you, Dale, though unlike you i don't have the data: If they would build it, they (we) would come. Where's Moonlight whats-his-name (from Field of Dreams) when you need him? Dale, I went right to the application with every intention of completing it and sending it in--until I found that a Twitter handle is REQUIRED. (A Facebook url, which I do have, is optional.) Oh, well, easy come, easy go. In college I once went up to visit Frank in New Jersey for a weekend of writing. Our friend Dennis and I came up on the train but had to come back on a night bus. Bleah! No comparison. Even a bad train beats a bus. Liz -- I hadn't noticed the Twitter requirement but on reflection it makes sense. Jessica Gross wrote tweats while on board her trial run and I suspect that Amtrak is looking for a continuation of that as a sort of quid pro quo. There ain't no free lunch! I noticed that Twitter requirement, quickly registered on Twitter, and completed the application for the trip. I'm not a regular Tweeter, but I'd be willing to Tweet each day for the experience. I'm glad you mentioned the residency. 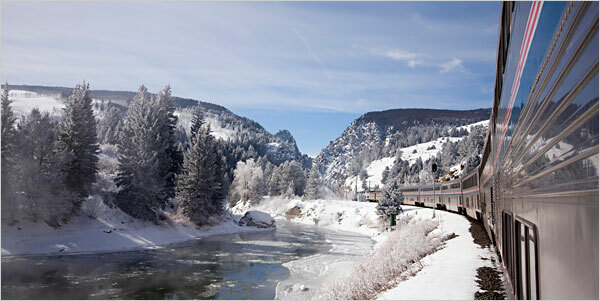 I have found myself wishing North American rail travel was less expensive. I recall your telling me about upgrade plans for AmTrak. I think the lure of trains is the journey more than the destination especially in this era of awful air travel. Rail is the best way to fly. Thanks for sharing about your great train adventures journey and get IRCTC Register detail to travel in train.